I have just got back from a trip to Crete with my 2.5 year old and my just 5 year old (who can’t read well enough to go through books). Two 4 hour flights, meals out every day, time inside when it got too hot at midday, so I took a supply of toys that I hoped would help keep them happy. On the plane I was sat in-between the two of them and on the whole it was fairly stress free, so I thought I’d share the things that we took with us, that ended up being a godsend. These were a real hit especially for my youngest. They are animals with a magnetic centre that you can swap heads and feet to make different creatures. 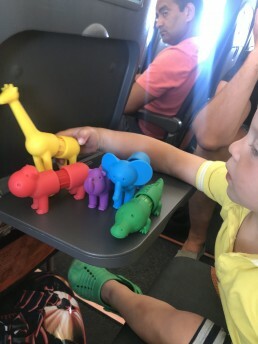 He had a good half hour on the plane swapping their heads, bottoms, acting out different scenarios, making different sounds and they fit nicely on the tray table so he was sat still which was a total bonus! 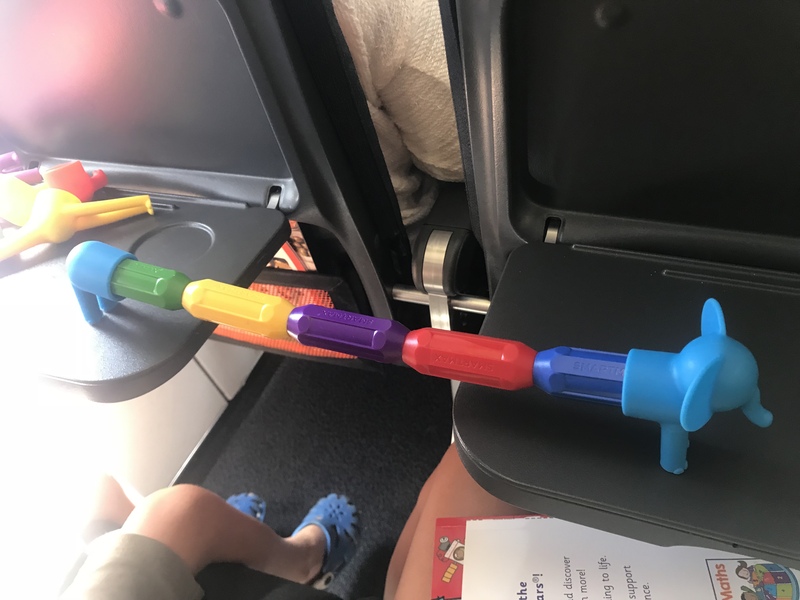 My eldest also really liked them, he was interested in how many magnets could stick together and working out why one end repels and the other attracts. I actually bought mine from Odds Farm in Bucks, but you can get them on Amazon for £17.95. I think this was one of the best distractions for us both on the plane and going out. My two year old just likes to scribble and erase over and over, but my 5 year old played naughts and crosses, ‘teachers’, drew various members of the family and we had to guess who it was (I didn’t fare well on that one), as well as practiced his writing skills which was a bonus. If you have a child that’s 4/5 I’d definitely recommend getting one. It is just the right size for small hands but fits a lot on. Mine was from Amazon and cost £5.99. These were an absolute winner for my five year old. He can get quite bored of the wipe clean numbers and writing books but we haven’t done a mixed activity book before. We had a mixture of them that included school type activities like tracing letters and circling correct shapes but then fun activities like spot the difference, crack the cryptic codes (which he loved), word searches (was quite impressed with how he did on those) and lots more. 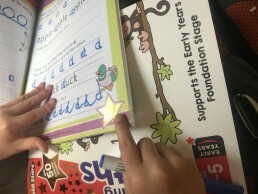 I also think it helps having stickers so they can mark their progress too, my son loves to tell himself well done! 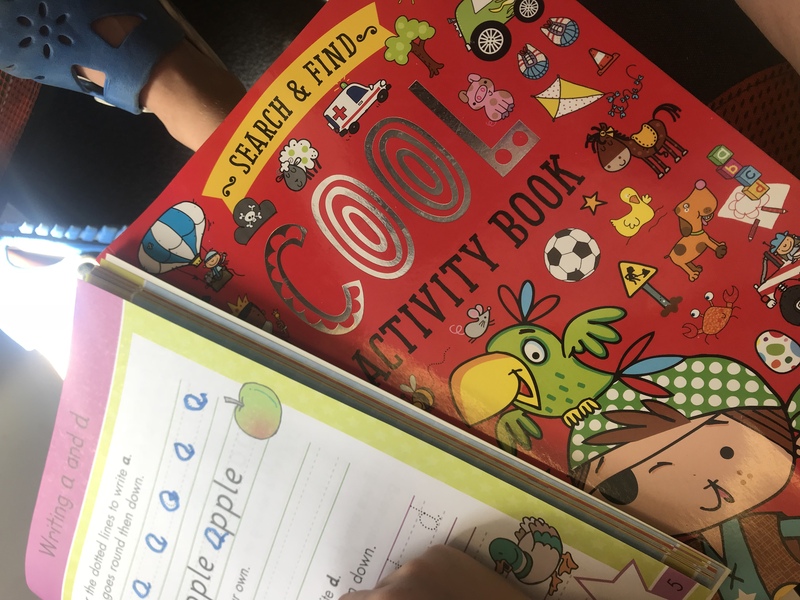 Where’s Wally books are great for this age group too In our experience. We spend a lot of time looking at those. Our favourite was a present so i’m not sure what it cost but amazon stocks loads of them at good value. I find The Works always have fab selections normally at around £1.50-£3. This is small enough to stow away in travel bags or hand bag on a night out and fits on tray tables easily. It’s great for 2 year olds and my 5 year old still really loves it too. You can connect pieces to make all sorts from space ships, houses, cranes, cars, horses etc. My two year old likes finding me the pieces and I build them with him and my 5 year old likes to make surprises so that we guess what they are. I got a large starter pack years ago after seeing my son playing with them so much at nursery. It’s fairly pricey but you can get smaller, cheaper packs too. The starter pack I have is £44. 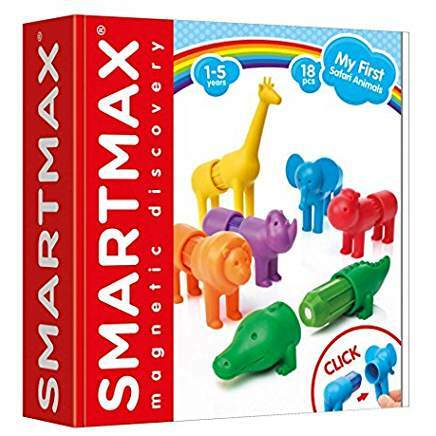 I’ve often looked at the different magnetic toys too but not personally used them, although I bet the work just the same. As a lot of parents probably do, I take duplo with me most places. Both of mine love pirates so a couple of pirates and mixed pieces of duplo kept them both entertained during meals and on the plane and in the car. 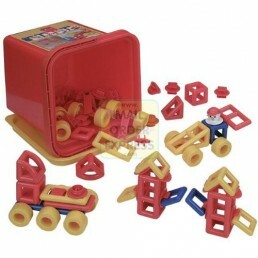 Especially as I took wheels so they could build cars and trains. You don’t need lots, just a few to keep them (especially the little ones) interested in sticking them together and pulling them apart over and over and over! 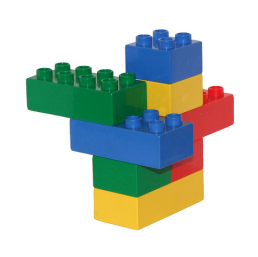 My eldest is into lego now but still loves building duplo too and the bonus is I can split the pile of blocks in half so no fighting! I HOPE THIS IS HELPFUL. WITH ANOTHER TRIP COMING UP FAIRLY SOON I’D LOVE TO KNOW WHAT YOUR GO TO TOYS ARE FOR THIS AGE RANGE… PLEASE COMMENT BELOW! 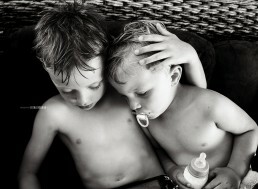 I am a photographer, specialising in anything to do with families. 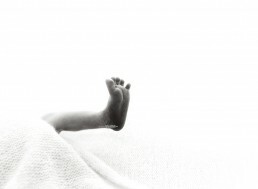 Newborn, baby and family portraits are my speciality although I also do commercial/ product photography too. 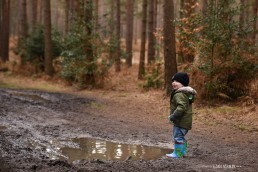 My favourite places to visit with friends and kids if you actually want to catch up! 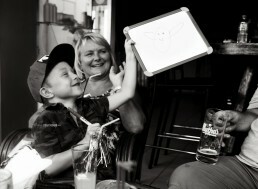 Love these ideas Fiona.I hadn’t thought of taking a whiteboard on holiday before but this is a great idea! If your boys love magnets you could take some magnetic shapes, numbers or letters as well, to make different patterns and practise writing little messages. Hope you had a lovely time.